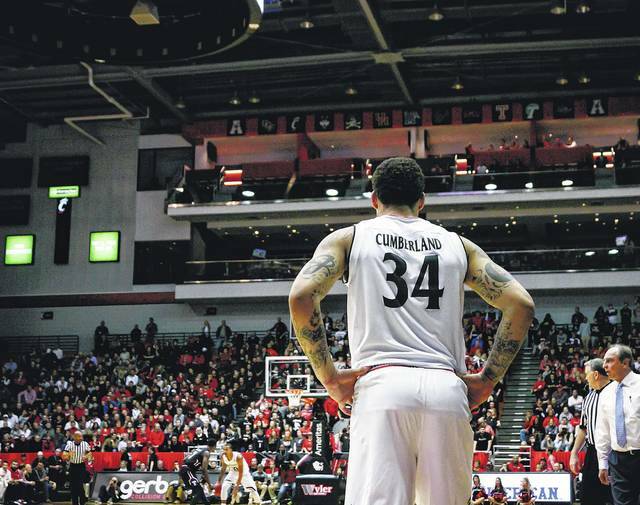 Jarron Cumberland (34) is the top returning player for the 2018-19 Cincinnati Bearcats men’s basketball team. 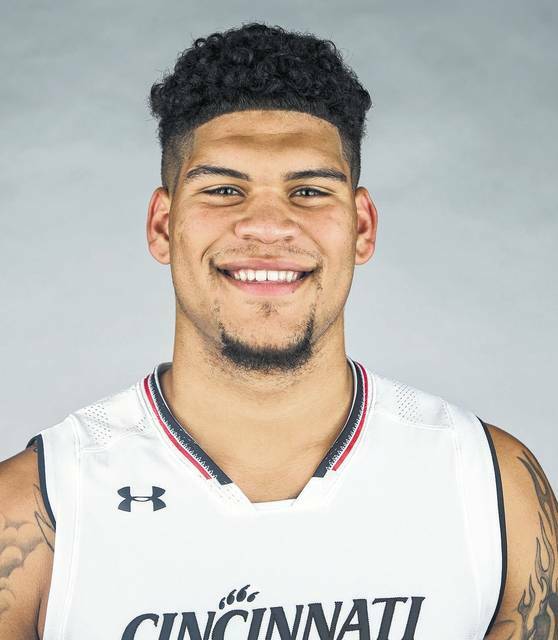 The Wilmington High School graduate and his UC teammates will open the season and their renovated arena Wednesday night. Last season: 31-5, reached second round of NCAA Tournament. Who’s gone: Guard Jacob Evans III (NBA), forward Gary Clark, forward Kyle Washington. Who’s back: Junior guard Jarron Cumberland, the top returning scorer at 11.5 points per game, leads a roster that will rely heavily on perimeter play. Senior point guards Cane Broome (7.9 ppg) and Justin Jennifer (4.8) are counted on for leadership and more points. 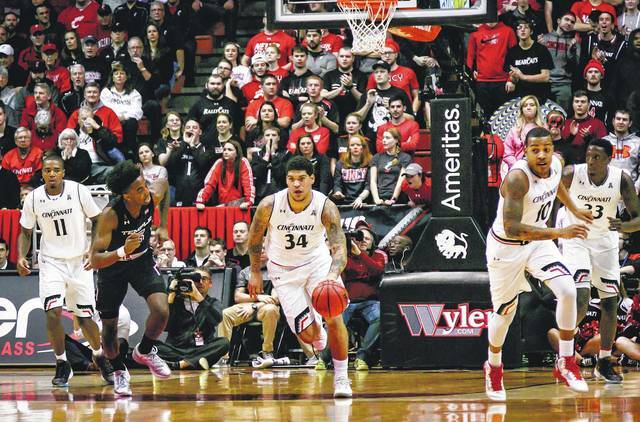 The Bearcats’ front line is undergoing a major overhaul as it tries to replace Clark — the Bearcats’ best player who averaged 12.9 points and 8.7 rebounds — and Washington, who averaged 11.3 points and 5.5 rebounds. Junior forward Tre Scott (3.1 ppg) is expected to move into a bigger role, along with sophomore Eliel Nsoseme (0.9). Who’s new: Swingman Rashawn Fredericks is expected to contribute right away as a transfer from Motlow State Community College in Tennessee. Freshman forward LaQuill Hardnett averaged 17 points, 10 rebounds, 4 assists at Perry Hall High School in Philadelphia. Freshman guard Logan Johnson averaged 22 points, 8 rebounds and 6 assists at St. Francis High School in California. How quickly they learn to fit Cincinnati’s defensive schemes will determine how much they play. The Skinny: Cincinnati had its best team under Cronin, winning the conference, going 15-1 at Northern Kentucky University and finishing No. 6 in the AP poll while its on-campus arena was renovated. The Bearcats blew a 22-point lead with 11 minutes left and lost to Nevada in the second round of the NCAA Tournament, matching the second-biggest meltdown in tournament history. They’re always a defense-oriented team. Their biggest question is whether they can score enough with Evans — their top scorer — and Clark gone. Expectations: Las Vegas oddsmakers give Cincinnati an 85-1 shot at winning the NCAA Tournament, the same as Ohio State — the opponent that opens their renovated arena on Nov. 7. They and Wichita State are expected to compete for the AAC title again. CINCINNATI (AP) — A new era in Bearcats basketball started when they moved into an on-campus arena in 1989. Bob Huggins turned them into a national powerhouse that was ranked No. 1. After he was forced out, the program fell off and Mick Cronin was brought in to dig it out. While their arena underwent a year-long renovation last season, the Bearcats made it back into the Top 10 — their best season under Cronin. They’re getting ready to reopen their arena on Nov. 7 against Ohio State, a team they haven’t played in Cincinnati since 1920. In a sense, the Bearcats have come full-circle, moving into a new facility while trying to build upon a high-profile season that ended badly. “OSU being the first game, that makes it more exciting,” senior point guard Cane Broome said. There’s a buzz about the Bearcats again coming off their 31-5 season that included an American Athletic Conference championship . They went 15-1 while playing at Northern Kentucky University, with a 76-72 loss to Wichita State ending their 39-game home-court winning streak that was the longest in the nation. Their season ended with a meltdown. Up by 22 points with 11 minutes left, they lost to Nevada 75-73 , matching the second-biggest collapse in NCAA Tournament history. The Bearcats have to replace guard Jacob Evans III, their top scorer at 13 points per game, and forward Gary Clark, their best overall player at 12.9 points and 8.7 rebounds per game. They were not only the core of the team but the most reliable players in the pressure-filled moments. FINALLY HOME: The Bearcats played only one game in Cincinnati last season, losing at Xavier . They and their fans had to cross the Ohio River to watch home games. They dressed in a temporary locker room on campus while their arena was renovated. Players are looking forward to having their own space again. ABOUT THOSE BUCKEYES: Ohio State leads the intrastate series 6-4. The last time they played was in the NCAA Tournament in 2012, when the Buckeyes won 81-66. CUMBERLAND’S TIME: Junior guard Jarron Cumberland is the top returning scorer. He averaged 11.5 points last season and had 103 assists, second on the team. His biggest problem has been getting into foul trouble early. Cronin has been harping on him during practice to avoid fouls. GUARD TANDEM: Senior point guards Cane Broome (7.9 points) and Justin Jennifer (4.8 points) each played about 20 minutes per game last season and are being counted upon to score more this season with Evans and Clark gone. NEW FRONT LINE: In addition to Clark, the Bearcats also lose forward Kyle Washington, who averaged 11.3 points and 5.5 rebounds. With both of them gone, the Bearcats will turn to an in experienced group including junior Tre Scott (3.1 ppg) and sophomore Eliel Nsoseme (0.9).